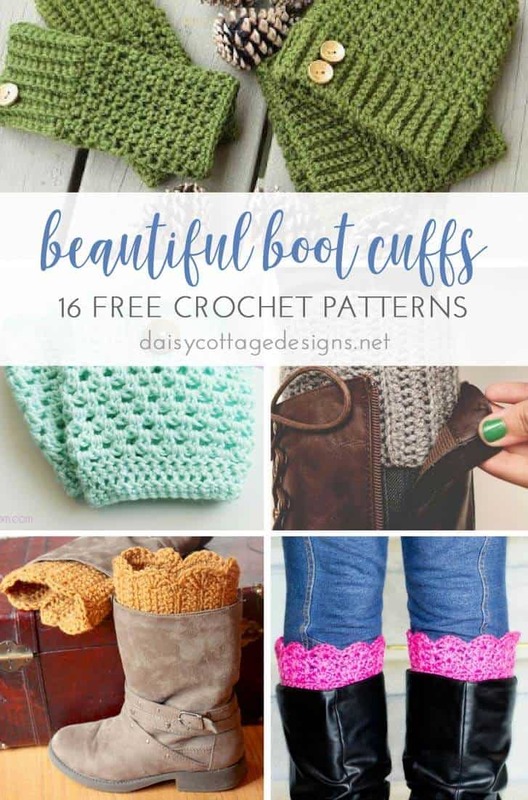 I love free boot cuff crochet patterns, but I have to admit something to you: I don’t even own a pair of boots. This Florida girl had to borrow a pair when she went to Alabama last winter. Even so, I think boot cuffs are absolutely adorable; and a totally fun way to add an adorable pop of color (and crochet) to your wardrobe this fall (and winter). 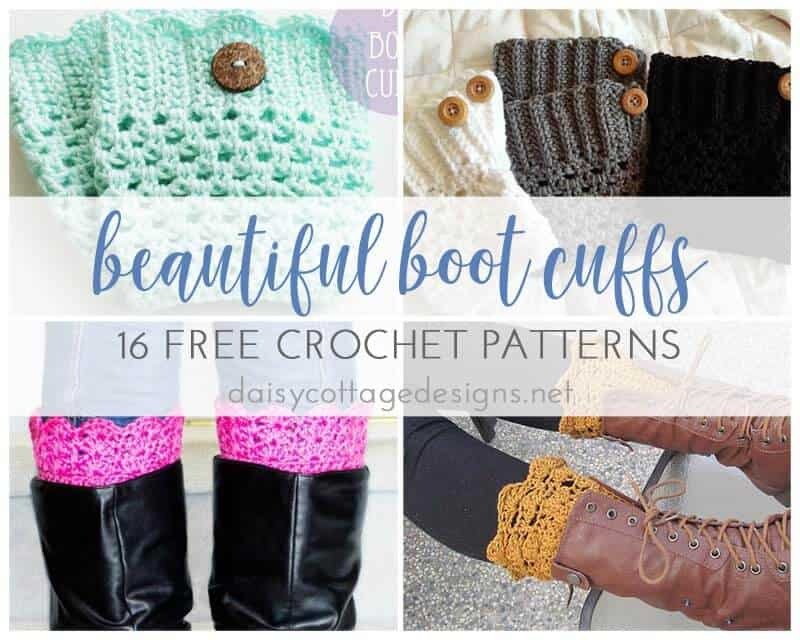 If you think they’re as cute as I do, your going to love this collection of free boot cuff crochet patterns. I’ve also added 12 more fun boot cuff patterns here. Scalloped Boot Cuffs from Crochet from J. These beautiful boot cuffs are unbelievably simple. Whip a pair up in an afternoon, and you’ll be good to go! Lacy Button Boot Cuffs by Whistle and Ivy. I love the feminine feel to this pattern! 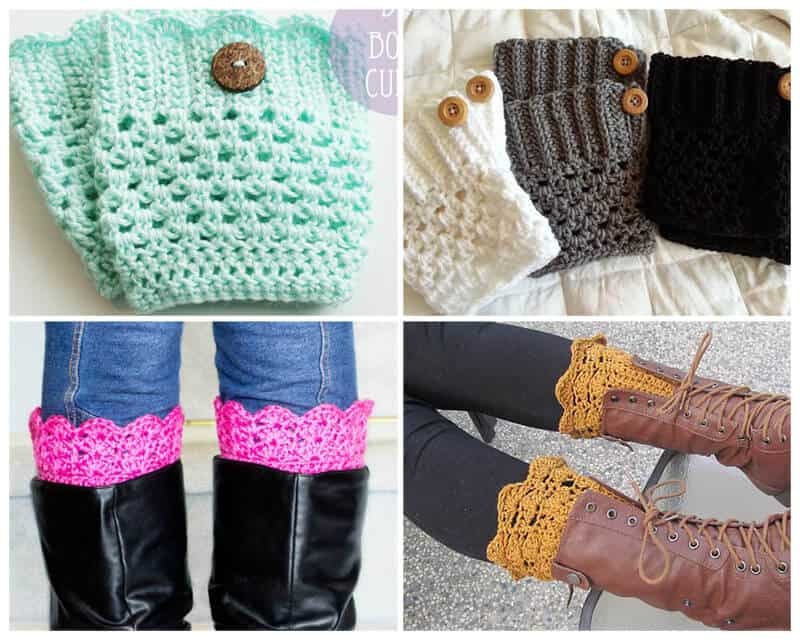 The buttons also add a nice touch to these beautiful boot cuffs! Crocheted Boot Cuffs from The Batter’s Box. This pattern has two options – with or without a scalloped border. Friendship Boot Cuffs from Fiber Flux. These adorable boot cuffs are made using a cozy, chunky yarn. Make them for yourself or surprise a friend with a great gift! Bow Boot Cuffs from Loops of Lavender. I absolutely love everything about this boot cuff crochet pattern! The bow adds an amazing touch to a simple pattern! Scalloped Boot Cuffs from Jenny Dickens. This free Ravelry download is the ultimate cozy boot cuff pattern. Simple and elegant, they’re sure to be a huge hit as stocking stuffers! Crochet Boot Cuffs from A Town Girl’s Life Simple yet beautiful, this is a Daisy Cottage Designs fan favorite! 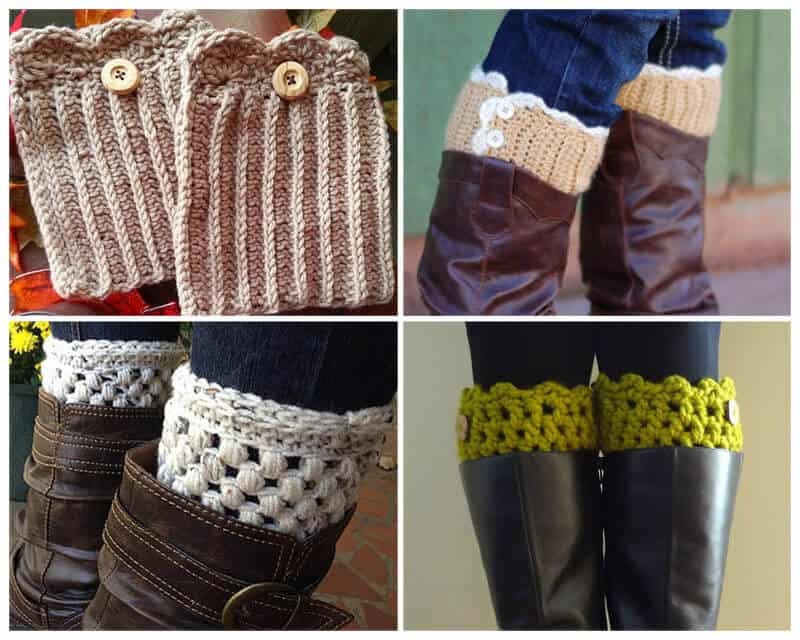 How to Make Crocheted Boot Cuffs from Better Homes and Gardens Update, as of November 2016, this link is no longer available. DIY Boot Cuffs from See Vanessa Craft I love the color and stitch pattern used in this adorable cuff! Boot Cuffs Pattern from Crochet from The buttons add a great touch! Vintage Inspired Boot Cuffs from Hopeful Honey Everything from Hopeful Honey is beautiful – especially her colors and photos! Belmont Boot Toppers from Jenn Wolfe Kaiser These look so cute with the lace up boots! Easy Reversible Boot Cuffs from Dabbles & Babbles Reversible boot cuffs – such a great idea! I think I’d even try a different color on each side! Scalloped Boot Cuffs from Just Be Happy Life These look classic and elegant to me! I love the scalloped edge and the color. 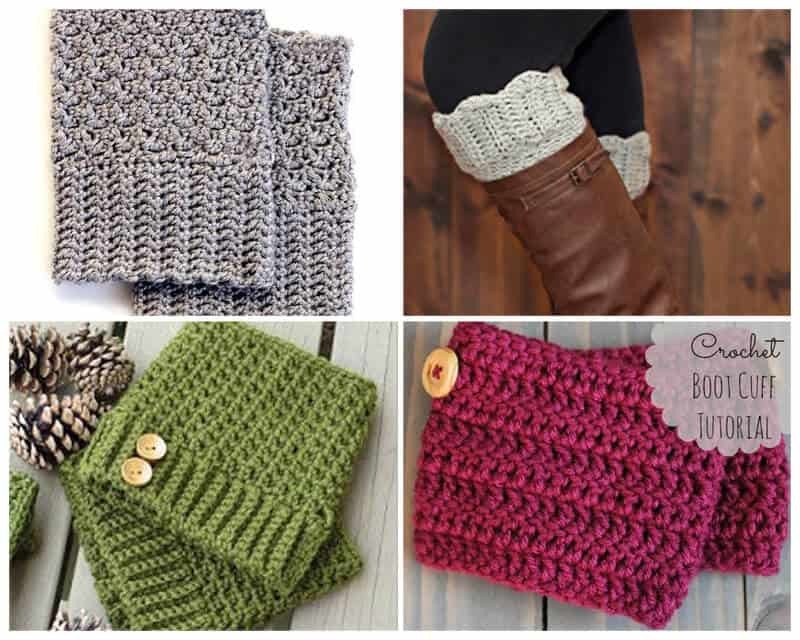 Brooklyn Boot Cuffs from Crochet Dreamz Make yourself some boot cuffs and adorable hand warmers in the same adorable pattern! Simple Crochet Boot Cuff from Sew Chatty Simple enough for even the newest crocheter! Love all the boot cuffs and thanks for sharing. Question-what is the best yarn to use for boot cuffs??? . Seems once you try them on the yarn begins to grow…thanks for your advice!!! Hmm… I would try a cotton if you’re having stretching problems. Also, if you were to slip stitch around the bottom edge that would probably help minimize the stretching.